Carlos van der Veek, co-founder of Fluwel, knows all about bulbs and he can talk about them with great enthusiasm. An interview with Carlos may therefore not be absent on our website. This page introduces you to Carlos and his vision on bulbs, the concept of Fluwel Quality and modern bulb trade, online and offline. Carlos gives Fluwel a face. Carlos was born between daffodils. “When I was born, the doctor that visited us smoked cigars,” says Carlos. “That must have been the first two things I ever smelled:. cigars and daffodils.” Daffodils were all over the place. His father grew them, and when he stopped growing, he began collecting rare species. ”It started very basic, with only a few species,” Carlos recalls. “Because we wanted to show some special daffodils to fellow farmers, we planted a few daffodils in our garden. That was when split crowns became popular, which was a novelty for the growers in our neighbourhood, the Zijpe.” It was a success, growers and breeders were enthusiastic, new species were planted.. “If someone came up with something new, he asked us whether we wanted to plant it in the garden. Thus, the collection has grown.” Today, it is the largest collection of daffodils in the world. Like his father, Carlos is a real daffodil specialist. “With a little luck, I became an exporter, in the 80's. That was an interesting period. 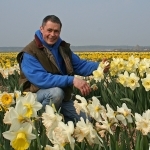 Thanks to the daffodil garden, I had good contacts with many breeders and that has only grown since.” The idea to found a bulb trade company was there and the circumstances were good. ”Initially, the company was named after me. When my brother Sigge came, there was no need to change this, his name is of corse Van der Veek too.” But the company didn’t stop growing. Eric Breed (“A bulb nerd just like me,” says Carlos) and Jeroen van den Hoek (“A talking tulip”) became part of it, making a different name necessary. After long debates, this eventually became Fluwel. A name that sounds nice, but is an abbreviation as well: Flowers love u, we enjoy life. Carlos wants Fluwel to be the center of the European bulb world. “We gather knowledge and share it, we collect bulbs and sell them, and more: we are breeding daffodils, crocuses and tulips, and in the future perhaps other flowers too.” Ambitions are high,, you can hear that when you talk with Carlos. The Fluwel Quality is not only a success on the internet. In famous show gardens, such as Schloss Ippenburg in Germany and Keukenhof in the Netherlands, the special bulbs of Fluwel are planted and seen by lots of tourists and enthusiasts. Carlos has an eye for quality and he wants to make Fluwel better and more important. That is the ambition. Choosing bulb varieties can be quite difficult. To help you out a little, let me tell you which ones are my favourites. Click here for my personal Top 10 listing of flower bulbs. High ambitions can only be achieved if you work hard. Carlos is present on the Fluwel farm throughout the day. He walks through the flower fields to see if everything is growing and flowering, he checks the quality of the harvested bulbs, he answers on questions coming in - but he is never alone. Fluwel could not exist without the enthusiastic employees and certainly not without the loyal customers. 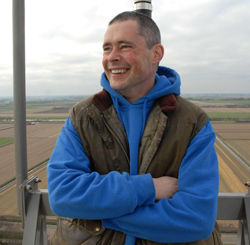 “That's the beauty of my job,” says Carlos gratefully. Build up, build on, and remain ambitious: that characterizes Carlos and it also characterizes Fluwel.